SAN JOSÉ DE LAS LAJAS, Cuba, Feb 25 2011 (IPS) - Based on their own experience, Luisa García and Jorge Medina, whose farm in Cuba produces a variety of food that feeds them year-round, said they have no doubt that food sovereignty can be achieved in their country and in the rest of Latin America. “Farmers have to work in an integrated manner on their farms, producing everything: that is the main aim,” Medina, a beneficiary of the Local Agricultural Innovation Programme (PIAL) for the past six years, told IPS. The project, co-financed by Switzerland, was launched in 2000 with the aim of getting local farmers involved in agricultural innovation, crop diversity and agro-ecology. PIAL has helped improve the lives of 50,000 farmers in 46 of the 169 municipalities in this Caribbean island nation. The participants, in turn, help spread their newfound knowledge in their communities. Pointing happily to the green field of beans — the third harvest since October — on their farm near the town of San José de las Lajas, 38 km from Havana, Medina stressed the need for further changes in agriculture. “Farmers should let young people and science onto their farms, because they always bring something new, and they give you ideas,” said Medina, who joined an agricultural cooperative six years ago, after working as a farm mechanic. Before the couple joined PIAL, they only grew two kinds of grains, compared to 30 today. They also grow fruits, vegetables, and jack-beans, which serve as a living mulch — a vegetative cover grown in combination with crops. They also produce worm humus, which they mix with other bio-fertilisers produced by agricultural research centres in Cuba. For their own consumption, they have a garden, and García cans, dries and preserves fruits, vegetables and spices, so they have a range of seasonal flavours on their table year-round. They also grow soybeans to produce their own cooking oil, as part of a project run by the cooperative they belong to. Most of what they produce is sold through the cooperative and by means of other marketing systems, ensuring the couple and their two children a decent income. But the issue of food sovereignty, which García and Medina see as within reach, is not a focus of public debate in this country. “Food sovereignty is not an issue in Cuba: there is talk about food security but never about sovereignty, which implies changing the content of the food we eat,” Mexican researcher Ana Esther Ceceña told IPS. According to local researchers, local production only covers 20 percent of the food needs of the population of 11.2 million people, which translates into a level of dependency on imports difficult for an economy starved of hard currency to deal with. Developing countries have to find their own ways of meeting the nutritional needs of their populations and modifying their concept of food needs, which almost always differs from the country’s real possibilities, said Ceceña, from the National Autonomous University of Mexico, who has made frequent visits to Cuba over the last five years. Since 2008, access to a healthy nutritional diet has declined around the world due to the impact of the global economic crisis that broke out that year in the United States. Against that backdrop, achieving food sovereignty has become even more urgent. The concept of food sovereignty was coined by Via Campesina, the international peasant movement, in 1996. It refers to the right of peoples to healthy and culturally appropriate food produced through ecologically sound and sustainable methods, and their right to define their own food and agriculture systems, rather than being dominated by the demands of markets and corporations. The goal of food sovereignty also includes greater participation in agricultural production by local rural populations, expanded access to healthy, ecological food, reduction of food imports to a minimum, recognition of the right of consumers to control their food and nutrition, and national sustainability and autonomy in food production. In 2009, 53 million people in Latin America and the Caribbean were malnourished — out of a total population of 589 million — according to a regional forum on food held in the Chilean capital in June 2010 under the auspices of the Food and Agriculture Organisation (FAO) and the Hunger-Free Latin America and Caribbean Initiative. 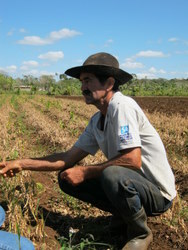 In Cuba, PIAL promotes local self-sufficiency in food supplies in the areas where it is active, and an increase in organic products grown by local farmers using experimental, innovative techniques as well as traditional methods like crop rotation. “Thanks to the research, with the little we have, we have managed to boost production,” said García, pointing out that optimum use is made of every corner of their six-hectare farm, named “Las Chiverías”. Besides feeding themselves, the family supplies the local market and makes donations to a school and to a maternity home. But the success story of “Las Chiverías” is not typical. President Raúl Castro has been pushing for changes in the country’s agricultural system since 2008, such as the distribution of fallow land to farmers, in order to increase production and replace imports with locally produced food. In the case of Cuba, “planning (by agricultural institutions) should be generated to an extent by consumer demand,” said Ríos, who is now a researcher at the University of Havana Centre of Demographic Studies. Food security in the Medina-García family, meanwhile, means they are not worried by the government’s recent austerity measures, like the gradual elimination over the next year of the ration book system, used since the 1960s to ensure that everyone has access to a basket of basic goods at heavily subsidised prices. “It doesn’t affect me to lose the ration book; I agree with what they’re doing. We supply our own needs with grains, vegetables, fruit and preserves,” Medina said. Over the last year, the only products purchased by the family with the ration card are sugar and salt.